By choosing Scott® you’ll create a healthy and hygienic washroom environment for your guests and employees. That’s because Scott® hand cleansers and paper towels help wash and wipe away more bacteria to reduce the spread of illness and keep everyone healthy*. 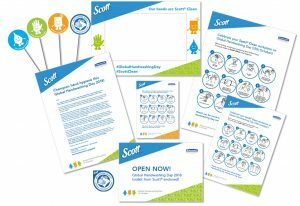 Scott® is teaming up with Global Handwashing Day taking place on 15th October 2018. The theme this year is “Clean hands – a recipe for health”. With more people eating at their desks or in meetings using their fingers and hands, it’s more important than ever that high standards of hand hygiene are maintained. Increased ‘hot-desking’ and shared meeting spaces also mean that poor hand hygiene can spread nasty bacteria and illnesses. To help you promote Global Handwashing Day through your digital communications channels we’ve put together a FREE handy eToolkit which includes advice on using your website, blog, social media sites, intranet and email to promote hand hygiene for your guests and employees. If you’d like to receive one of these toolkits, please marketing@bunzl.ie or call us on +353 1 6301800 by Wednesday 10th October.